CoolBELL bases on the cutting-edge of fashion trends. Pursuing the best quality of laptop bag category and devoting to providing the best product and service to customers. We make every effort to achieve the best in every detail of design,color, material, sewing, sales and service. Fits laptop brand like Dell / HP / Toshiba / Lenovo / Acer / Macbook air/ macbook pro/ iPad / iPad pro which ups to 15.6 inches. Size: Size: 16.5 x 4.7 x 12.2 inches; Fits up to 15.6 inches laptop. 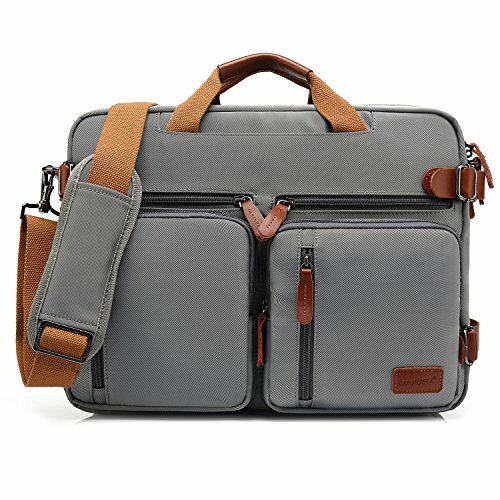 Construction: Two main compartments designed for keeping laptop or tablet etc. Accessory compartment with pockets inside for keeping items like power cord, mouse, keys, passport , phones etc. Three Front pocket with zipper design. It is convenient for carrying pens, power bank, phones etc.Safe for your items. Two layers of stronger shockproof padding keeps your laptop from being shocked. A durable luggage belt is convenient for fixing the bag on the trolley of a luggage case. Dimensions: 16.5 x 4.7 x 12.2 inches; Fits up to 15.6 inches laptop.Large capacity for keeping 2-3 days summer clothes.